Artificial intelligence. Blockchain. Cryptocurrencies. Globalization. Alternative legal service providers. Virginia lawyers struggling to understand how these forces might shape their practice have a new resource. 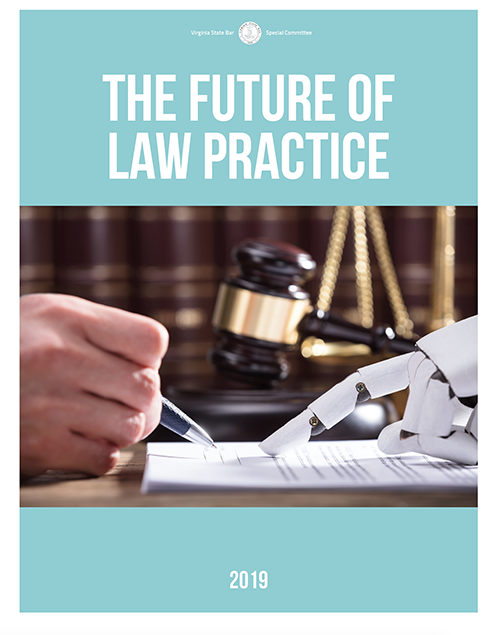 The Special Committee on the Future of Law Practice released its final 2019 report today – a follow-up to its 2016 version. Via regular meetings where members compiled studies and reports from other bars, and with input from guests outside the legal profession, the committee presents a range and depth of information on external, technological energies changing the practice of law. That includes increasing competition from nonlawyer service providers, generational pressures that are likely to impact law firm business models, the future of billable hours, the insourcing and unbundling of legal services, the accelerated globalization and multijurisdictional trends of legal services, and more. The report concludes by offering a series of ten recommendations to the bar, its committees and boards, law schools, and all Virginia lawyers. The bar encourages lawyers to read the committee’s report in full (pdf).